Seventeen weeks pregnant and facing a miscarriage, Savita Halappanavar and her husband Praveen walked into an Irish maternity ward in October 2012. Unwittingly, the couple also walked into that deeply controversial arena in which Ireland’s legislative position on abortion remained unresolved. A week later, Savita was dead from septicaemia. Reports of her death and of the refusal to allow Savita a termination of her pregnancy sent shockwaves across Ireland and around the world. Once again the subject of abortion was catapulted to the very top of the agenda in Ireland. 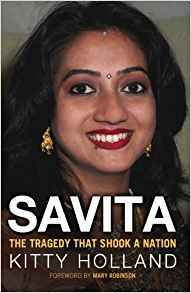 In Savita: The Tragedy That Shook A Nation, Kitty Holland reveals the truth behind the headlines and explores many unanswered questions: Who was Savita? How significant was it that she was a non-Irish, non-Catholic woman in search of help on Irish soil? And how did her husband and her community’s reaction to her death shape the parameters of the debate which followed? Holland’s expose also looks at how the tragic circumstances of Savita’s death played a part in compelling the Irish Government to finally legislate on abortion and how activists on each side succeeded or failed in shaping that legislation.